By George Zehnder and Wynde Dyer, et al. Most Fridays through September, 12-6 p.m.
Friday, June 24th, 6-8 p.m. Slogan submissions and consignment orders accepted 7-days-a-week. Stop by and leave your order and contact info with the shop-person! 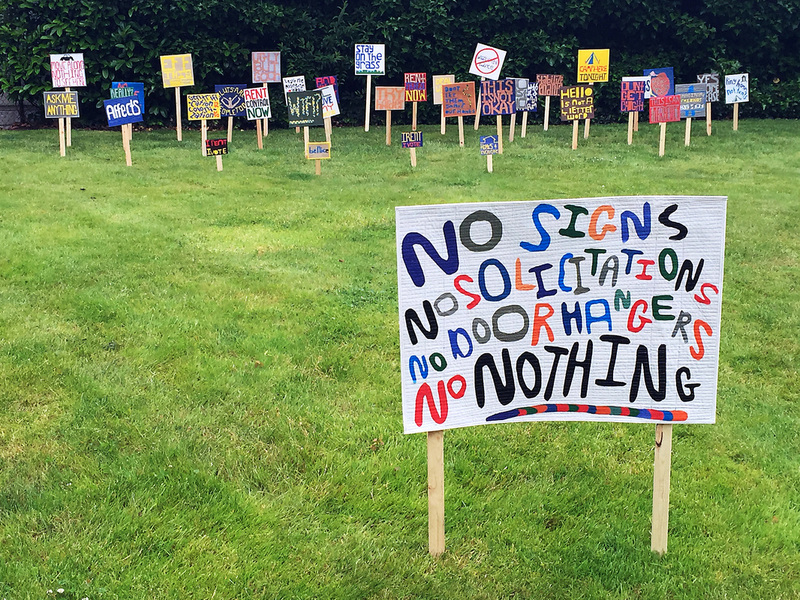 Your Voice Heard by 12-year-old George Zehnder and professional artist Wynde Dyer, et al., features a collection of hand-cut tarp-quilt yard signs with audience-generated/crowd-sourced slogans that range from personal to political, silly to serious, and ambiguous to explicit. When posted in local lawns, these messages plant seeds of critical thinking and compassion in the minds and hearts of passers-by, they spark conversation in the mouths of friends and strangers, and ultimately stand to diversify the landscape of general election lawn signs we’ll see pop up between now and fall. In a day and time when most people don’t feel their voices are being heard by people in power, the yard signs in Your Voice Heard give participants the chance to be seen and heard. For the month of June members of the public are invited to design their own yard signs at Reading Frenzy, where Dyer will have a DIY tarp quilt yard sign station set up in the gallery. Dyer and Zehnder will be on-site in session every Friday in June to facilitate the design of DIY yard signs. Individuals of all ages and abilities are encouraged to stop in to design a sign. Yard signs will be free to propose, and free to design, and will be available to purchase and borrow, as well. Free to design your own sign! NOTE: if there's a sign you like but you cannot afford it, we are happy to discuss work trade options. We always need folks to (a) cut stakes, (b) fold stake straps, (c) fold binding/trim, (d) sew stake straps, (e) quilt the signs, (f) cut out letters, (g) deliver signs, (h) gallery sit, and (j) other helpful task as needed. While it is important for us to value our labor and materials, we want to make sure our artwork is accessible to everyone. Email wyndedyer@gmail.com for more details.